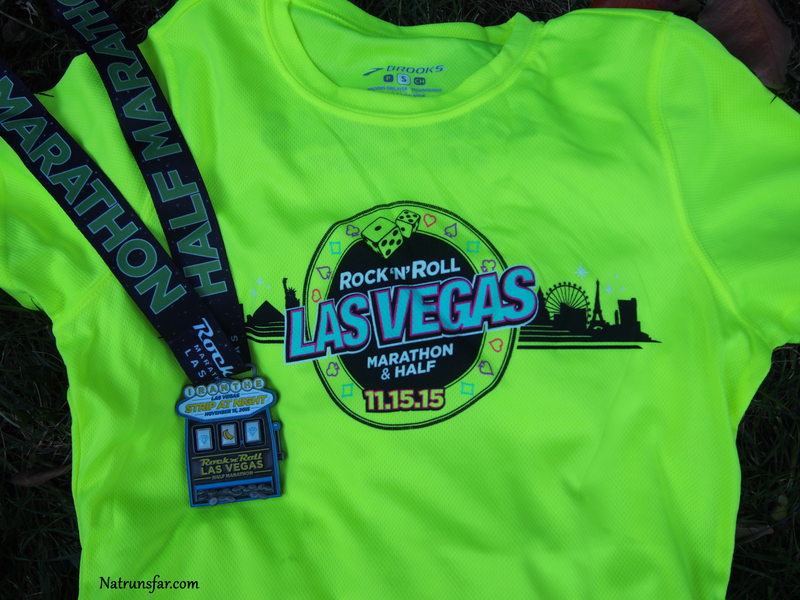 Natrunsfar: Rock N Roll Las Vegas Half Marathon: Day Three And Four!! 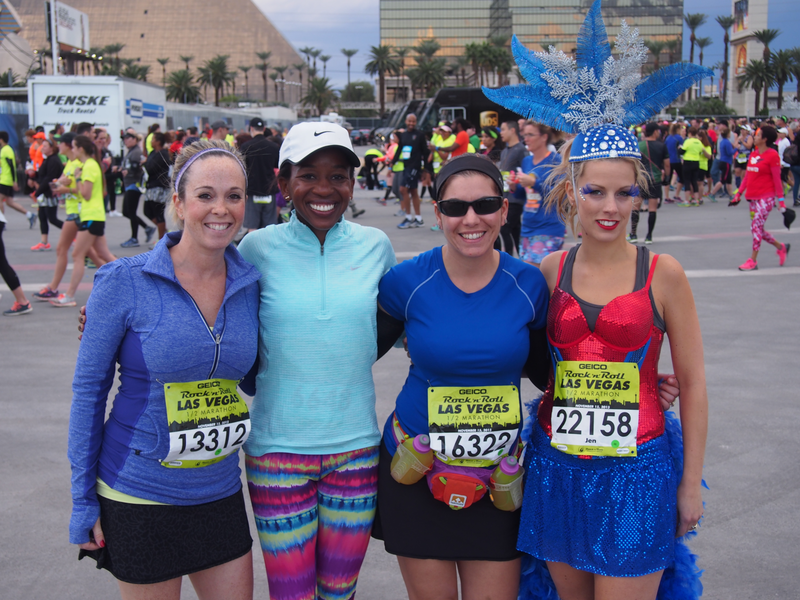 Rock N Roll Las Vegas Half Marathon: Day Three And Four!! Let's just get this out of the way right from the beginning. 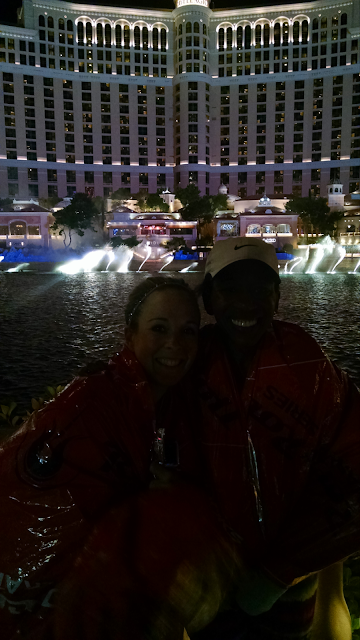 I did NOT get to actually run with Meb. 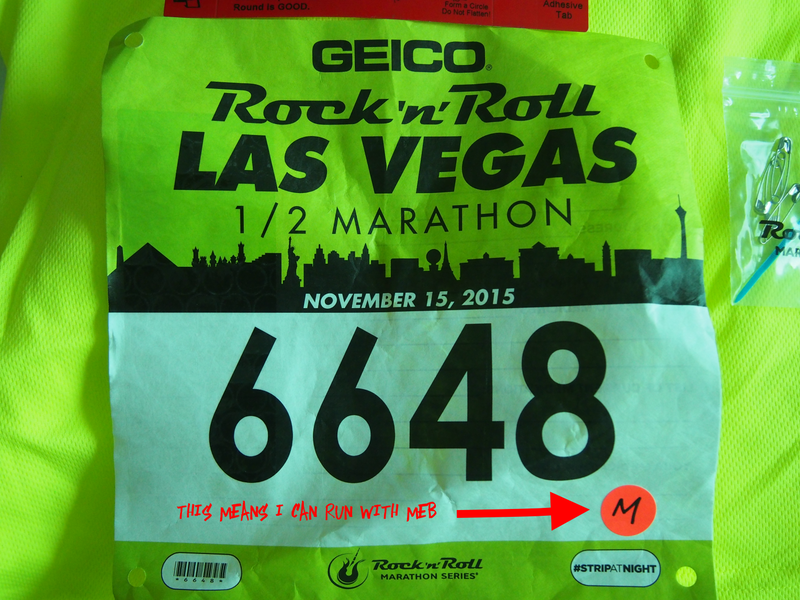 If you look at my race bib, you can see the orange dot with an "M" on it. That is the sticker they gave me to be able to run with Meb. When I left off on Saturday night, we had just finished an awesome meal at Tao restaurant in the Venetian Hotel. Next time you go to Vegas ---> put it on your list!!! We all agreed to sleep in on Sunday morning and meet for a late breakfast/brunch. 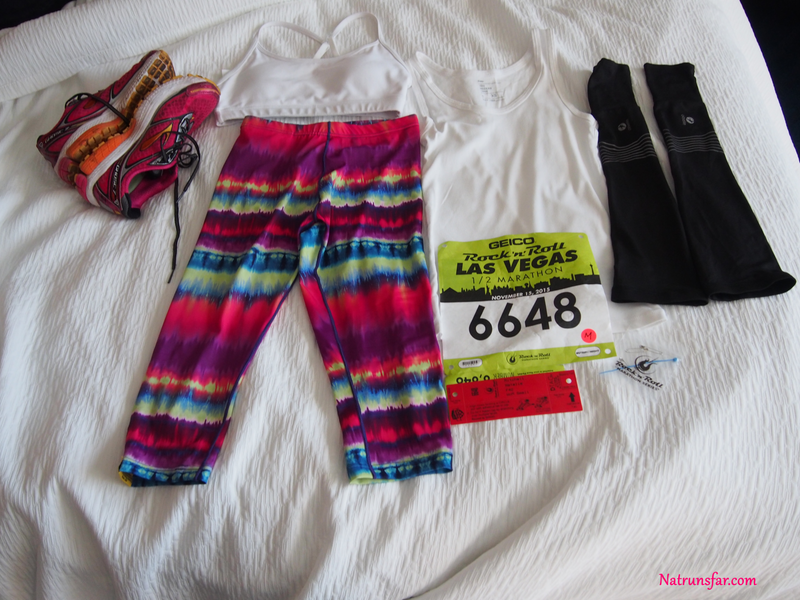 Flat Nat is ready to run! Sue took a fun video of Jerold and I jumping in front of the sign, so we could get a still shot for a pic. 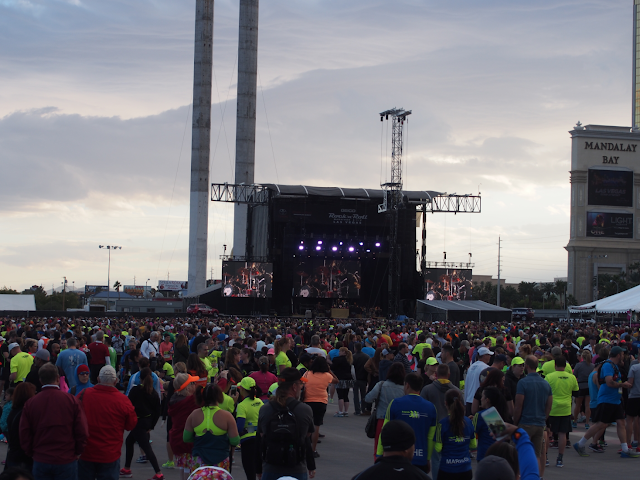 Afterwards, we all headed back to our room to rest and the plan was to meet up at the Kid Rock pre race concert. This is also where they had a gear check set up, porta potties and then all the corrals lined up for the race. Rest for me, more hydration (I stopped pretty much all water intake at about 2:30 PM - 2 hours before the race so I was less likely to have to pee during the race) and then Jerold and I headed over to the concert. When we arrived, it was crazy! A sea of runners everywhere, with everyone trying to get into the concert. We finally made it in!! Kid Rock rocking the house! It was so fun to finally meet Jen and her costume was awesome! By the time I was finished, it was definitely time to high tail it to my corral. The first corral we came to was corral #47. 47?!!! I was supposed to be at corral #6!!. At that moment, we knew we needed to run to get there. Luckily Jerold is tall and he grabbed my hand and away we went. "Excuse me, pardon me, sorry, excuse us!!" was what we said the entire way and then suddenly we made it with plenty of time to spare. Whew! I immediately asked a Rock N Rock official who was sitting on a media vehicle where exactly was I supposed to meet Meb and the group. I showed her my bib and she told me not to worry. Just to stay right where I was (between corral 6 and 7) and before the race began, we would see Meb. Ummm. okay. But as the time ticked on, I looked high and low and didn't see him at all. At that point I thought maybe he decided not to run because of the weather? I didn't know and I had no idea where else to look for him as there were runners everywhere. 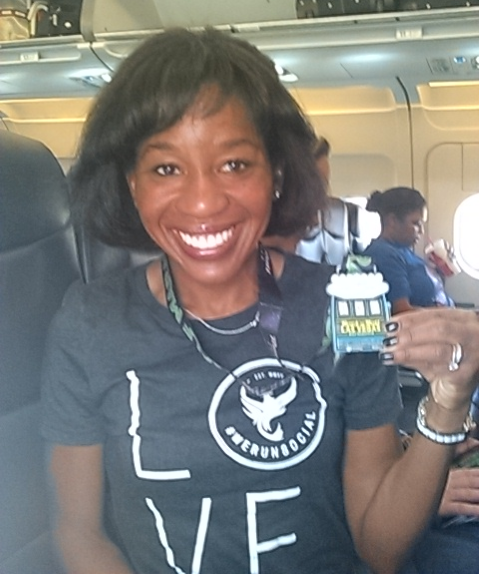 So, I focused on my race and tried not to think about it. I was thinking about the run so much that it didn't really register to me that Jerold was telling me that they announced that Meb was now running in corral 3 and then they were off!! There was nothing I could do at that point. I was in corral 6 and I wasn't going to be able to reach the group. Such a bummer. Jerold told me they finished like 2 minutes before I did. Somehow they must have decided to change his corral number. I guess the only thing I would have done differently is showed up 2 hours before the race and camped out in the wind? I don't know... But, I had a race to run and I was ready to have a blast. Here we go!! Let me say, if you are ever thinking about running this race - do it!!! It was SO much fun. 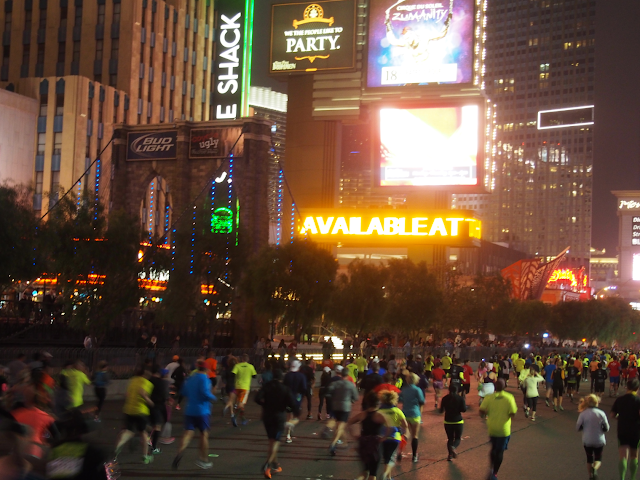 To run down the Vegas strip at night is pretty amazing. 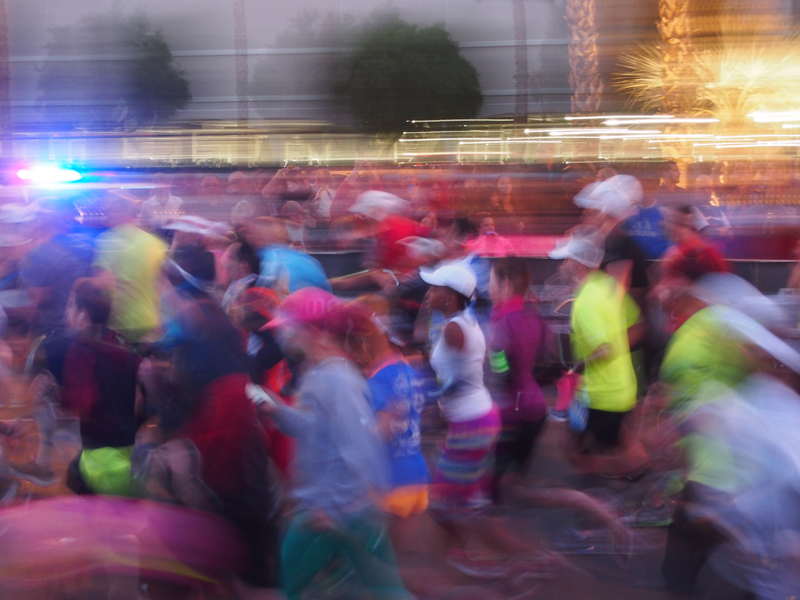 They had the runners well organized with all the corrals and it felt like everyone in my group was running about the same pace. It was surreal and such a big party. The music was pumping and I could feel myself smiling - this is it!!! My first race in one year and after knee surgery in April, an entire summer of rehab, crutches, a huge brace on my knee, not running for 8 long months... this was so exciting for me!! All I could think about was not going out too fast. My coach wanted me to take it nice and easy in the beginning. 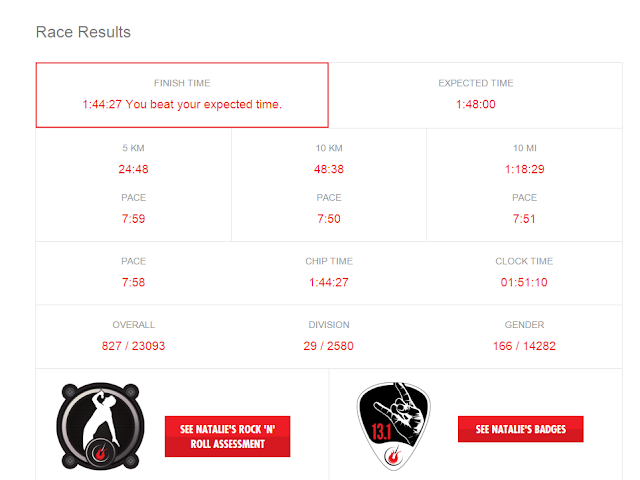 There was no time goal in this race and I didn't know what my body could really do. I was hoping to run under 1:50, but I just didn't know and at this point my longest run was only 10 miles. I had only done one short tempo run and then a run with 8 x :30 second strides the week of the race. That's it. I was not training for this race as I am still in the building block phase of coming back from surgery. Okay. Here we go. The course was flat, the weather at the moment was nice and cool, very little wind. I still didn't know what to expect. 8:00 flat - I'll take it. Umm, okay. It did not feel like 7:44 for mile 3. I was smiling and felt good. The water stops were very plentiful by the way. My coach told me to take water every 3 miles, so I got water at this stop. Still cruising along. Feeling a little shocked that I am running this pace. Note: my training runs are no where near this pace at this phase in my training. What? It felt good, so let's roll with it. I can feel the winds picking up big time. I wear contact lens, and I kept thinking, please don't let any dust blow into my eye and make me lose my contact lens!! I also took a GU (Espresso flavor --> it has a nice huge jolt of caffine and I don't drink coffee, so I can really feel the effect. Yee haw!!) and there wasn't water at this point, so had to wait a couple of minutes for water. Here is what I was thinking: the wind may be blowing me around like Dorothy in Kansas, but that is not an excuse to lose the pace right now. Stay relaxed and focus. Oh. there's the water!!!! Yay!!! I guess the GU is working.... !! Okay. At this point it is raining, the wind is blowing and I am thinking if I get to mile 10, the I only have a 5k to go. There was a part of the course where we are in old Vegas and we veer off the strip, no spectators, but there was a band playing Christmas music!! So much for a negative split! Ha ha! :) It's raining and the street is pretty slippery. I really want to be finished at this point, but keep pushing - you aren't done yet!! The finish line came upon me out of nowhere. Usually I really have a sprint at the end, but not today. I did a little facetime with my kiddos which was really neat. They were so excited to see me and I was so happy to see their sweet faces! After that, I immediately thought about recovery and went to get my medal and had a bottle of chocolate milk, a banana and some pretzels. The medal is pretty sweet and it glows in the dark and let's just say you won't miss anyone wearing the t-shirt! It was SO COLD after the race!! The heat blanket helped a little but my teeth were chattering. We had to walk a very long way back to the hotel as the strip was still closed. 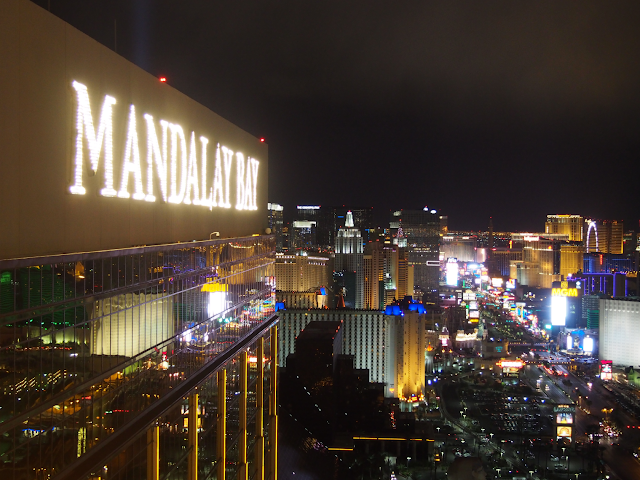 We finally made it back to our hotel (The Mandalay Bay was a great hotel - spacious, nice rooms, great service, close to the starting line - I would definitely stay here again)! I took a nice hot shower, kept hydrating with water and took a few minutes to use the R8 roller to work on my muscles. I also stretched a little bit. After dinner, we went to the top floor of the hotel - there is a bar called the Foundation Room. 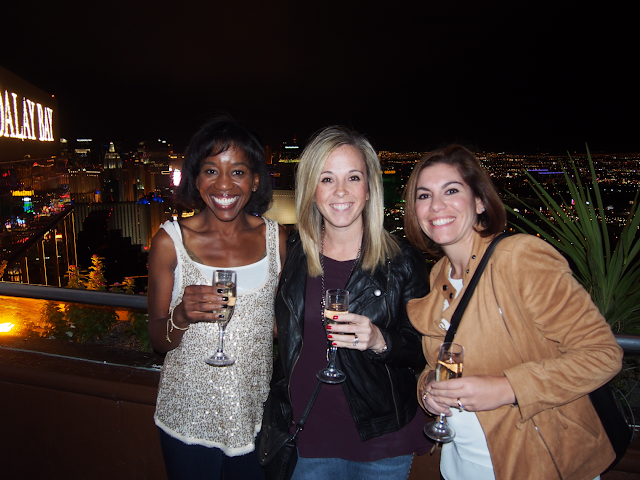 The views of the strip are amazing and turns out they were letting ladies in free + a free glass of champagne! Yes, please! We said goodbye to Sue and her friend with huge hugs and fun wishes of seeing each other again (DC? LA? New England? All the possibilities!!) Then it was off to bed for much need sleep!! Sunday morning we slept in a bit, had breakfast and really wanted to meet up with the We Run Social Crew. We realized that it would be cutting it too close to get over to meet them and decided to head to the airport. It's a good thing we did - the line for security was insane! So, that's it!! 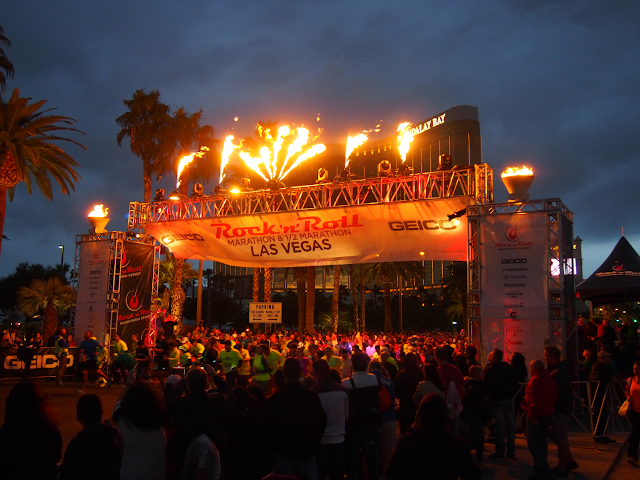 My recap of the Rock N Roll Las Vegas Half Marathon. It was such a blast and I would definitely run this race again!! 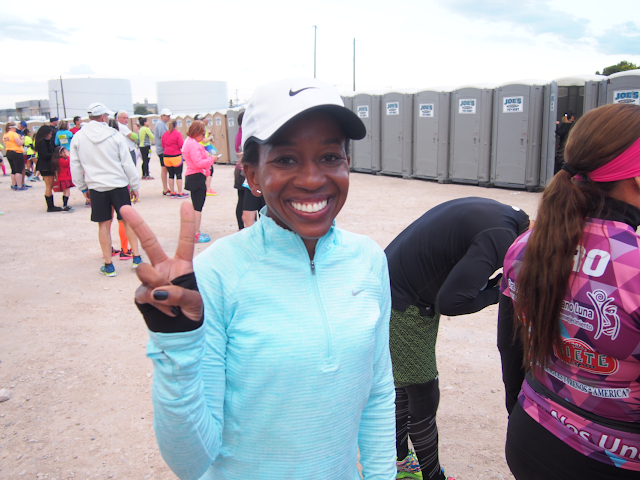 I have a ton more fitness to gain in the road to Boston 2016 ---> it was so fun to test myself at this stage in my journey and I had an awesome weekend! PS: Last but definitely not least, a big thank you to Jes from Run Lady Like for featuring me on her blog last week!! The article came out the day I arrived in Vegas and I hadn't had a chance to talk about it on my blog. Go HERE to check out the article on my running journey. Which Rock N Roll races have you run? Do you have a favorite?